We know how much you’d like to attend one of the workshops we schedule around the area, we know how much you’d like to attend such an informative workshop, and we know being able to arrange time in your busy schedule to attend is practically impossible. So, we’ve done the next best thing and brought our workshop to you! Grab a coffee, soda, or your favorite beverage, find a comfy spot, click on the link below whenever you can and spend just over 20 minutes learning about the financial aid process. When you’ve finished and find yourself emerging from your state of paralyzing fear, reach out by phone, email, or our contact form and we’ll schedule you right away for the first meeting in your college planning campaign. 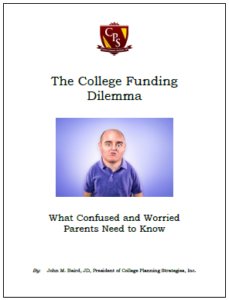 You’re about to discover what “confused and worried” parents need to know and understand about the college funding dilemma. If your gross family income is $70,000 or less, you probably shouldn’t waste your time by reading further (or downloading the e-book) – you likely will be eligible for most financial aid available. Just be sure to choose schools that have the budget to give your family everything for which it qualifies. On second thought, maybe you should download the e-book. If your gross family income is $70,000 or more, it’s time to begin. You will need all the help you can get! 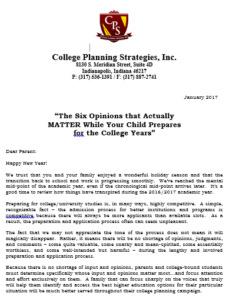 The bottom line is that your family’s college planning must be a campaign – not a skirmish, not a battle, not a 4-hour window of intent on some random Tuesday evening. 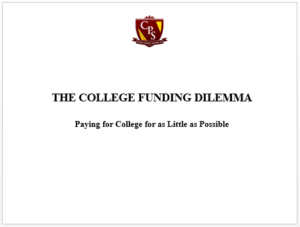 Financial & Asset Management: Will it Help or Hurt Your College Student? For a free copy of one of our monthly newsletters, click below.